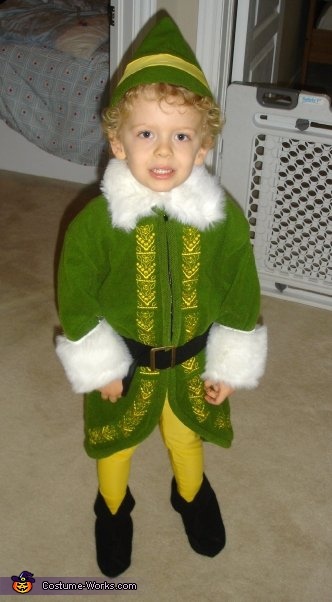 My son is wearing a homemade "Buddy the Elf" costume. The costume inspiration came from his blonde curly hair. Any chance you'd be willing to make another to sell, or we could rent this one for a family Christmas photo? I was wondering the same thing! Any chance you would make another or sell? I LOVE it!! Please make another to sell! Let me know asap or even for next year Halloween! This is still my favourite of all our family/child costumes. Unfortunately I won't be making another costume this year. We just brought a newborn home. Not selling at this time, as we've got two younger siblings than our original "Buddy the Elf." How did you do the gold detailing along the center seam? Any chance you would make a costume to sell for this Halloween? 2014? I am also interested for my 4 month old son. Not sure if you are selling or creating these at this time. Congrats on your expanding family! I am going to attempt to make this myself! Fingers crossed!! We had one made; the gold brocade edging makes all the difference! It looked quite boring without it. For an adult it was ~$20 worth of material, and our tailor sewed it for $50. So worth it! Hi I know this post is a few years old but can you tell me where you got the fleece coat? I am trying to make one for my son for Halloween this year. The fleece coat, was hand sewn. Any interest in selling this costume?